Technical information about Broadcasting House in the 1930s. Manual. The drawings have been reconstructed from originals in the Technical Description book. It has not been possible to work out how every part of the system operated. In some areas there is a total lack of information, in others we find contradictions. But hopefully we have presented here as accurate a description as is possible today, at least until more detailed contemporary sources can be found. We'll begin with the technical heart of the building - the Control Room. The photo, right, was taken from a position near the bottom of the general layout drawing, below. It's important to remember that this really was a 'control' room. Many of the studios had just a single microphone the output of which was wired directly to the control room. In these, and indeed in most other cases, the control of level was entirely done at the control positions in CR. Studios were not equipped with programme meters. Those studios with more than one microphone had a simple passive mixer installed in a 'listening room' which also mixed in the output from gramophones where these were provided. If there was a 'silence' or 'announcing room' then the output from the mixer was fed through the announcer's desk where he could switch (not cross-fade, it seems) between the studio microphone and his microphone for announcements. The output of this desk was then fed to CR, and was there routed through a control position. There were a further two types of mixer, one for music programmes, the other for drama. 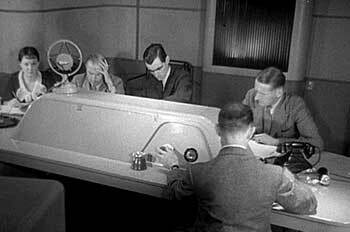 These were located remotely from the studios, and allowed the operators to monitor the programme on loud-speakers - not possible in the Control Room, where headphones were the order of the day. The Marconi_Reisz microphone is described here. Just two types of microphones were commonly in use, the first BBC ribbon microphone not being introduced until 1935. There was the Marconi-Reisz carbon microphone and the bomb-shaped Western Electric condenser microphone, which, because of its low output, contained a preamplifier within its housing. 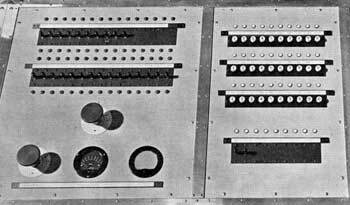 The outputs from the studios were nominally minus 68dBu, and were wired to the control room in lead-covered cable. The photo, right, shows the mic cables running in vertical chases formed in the outside walls of the studio tower. All the amplifiers were powered from storage batteries as mains powering wasn't considered reliable. 4 volt filament supply for the 'A' amplifiers only which were indirectly heated to reduce valve noise and to minimise interference caused by switching other amplifiers fed from the same battery. preamplifier of the condenser microphones. The 8-volt supply was also needed for polarising the Marconi-Reisz carbon microphones. In order to lengthen valve life, the amplifiers were switched on only when required. The diagram shows the general arrangement. By operating the key (which was on the jackfield) an engaged lamp was lit on the jackfield. Relay LT operates and switches on the LT supply to the amplifier and, in the case of the 'A' amplifiers, the 8 volt supply for the valve filaments in condenser mic amps and for polarising the carbon mics. Also for the 'A' amp's, another relay (HC) switches on the 300 volts for the condenser mic amps HT supply. The manual operation key was provided mainly for use when testing amplifiers and probably when setting up sources for the Dramatic Control Rooms. The switching was usually done by the source selection and routing system. 'A' and 'D' amps were automatically switched on when the associated input switching relays were operated from the CR control positions. 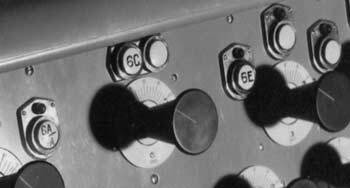 'B' amps were switched on by the control positions' first operating key and 'C' amps by a similar key on the simultaneous broadcast position. 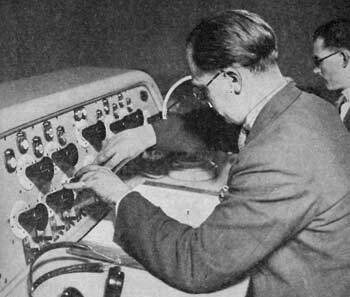 There's an account of the control room amplifiers from the 1933 BBC Year Book here. There was an alarm system to warn the engineers of an amplifier failure. The H relay would release if the amp's HT feed fell below a certain level, perhaps because of a fuse blowing or a valve failing. This lit an alarm lamp on the bay and operated the P relay. The P relay, in turn, lit another alarm lamp and a bell. The engineers could then find the bay with a lit lamp, and check the relevant amplifier by looking through the valve windows in the amp casing. The four types of amplifier used in the broadcast chain were referred to as A, B, C, and D amplifiers. 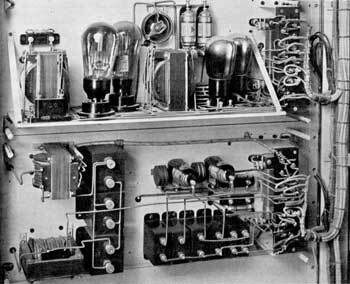 The 'A' amplifier was the first in the chain and had a gain of around 50dB. It raised the level incoming from the studio from -68dBu to -18dBu. There were 31 of these amplifiers installed, 21 for use with studios, 5 for echo rooms, 2 for the Dramatic Control Panels and 3 spares. Each 'A' amplifier bay was equipped with five amplifiers, a jack field, relays, alarm lamps and termination strips for connecting the cables from the studios, etc. to the amplifiers. The jackfield provided apparatus, line and listen jacks for the inputs and outputs of the amplifiers. 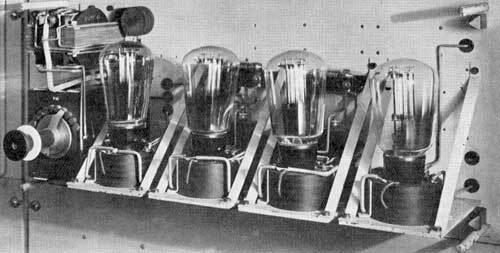 Above left - a view of the front of an 'A' amplifier with the cover removed. Note the stud potentiometer, which gave gain control in 4dB steps. Maximum gain was about 50dB. Left - the back of the 'A' amplifier. Another bay in the same rack as the 'A' amps had jacks accessing a second output of the amps. This was used for echo; the inputs to the echo room loudspeakers also appeared on this bay. The echo room mics were wired to further 'A' amps. the outputs of these were then plugged as required to the source selection system. The same bay contained the jacks for connecting the inputs of the dramatic control panel. The outputs from the sources' A amplifiers at -18dBu were distributed to the control positions in the control room where the operator (an AME, Assistant Maintenance Engineer) selected a studio on his 2 or 4 channel 'fade unit'. The output of the fade unit then passed through the 'Main Control Potentiometer'. This introduced a loss of about 14dB at its normal setting. It was followed by a 'B' amplifier, sometimes referred to as 'the control amplifier', with a gain of up to 40dB. This raised the level up to about 0dBu with maximum peaks of +10dBu. This attenuation followed by amplification was to make it possible to increase the level of low level sources which otherwise would have been impossible. There were 16 'B' amplifiers, one for each control position plus two spares. They were mounted on bays together with their associated programme-meter amplifiers. In the photo - right - the 'B' amps are the ones with four inspection windows. The relay switching arrangement included an extra relay to operate the meter amp which was considered as part of the 'B' amplifier circuit. A stud potentiometer controlled gain in 4dB steps, the maximum available being about 40dB. left - The back of a 'B' amplifier and, above it, a programme-meter amplifier. The latter fed a meter with a scale that looked just like a PPM but wasn't. The meters were neither peak reading nor average reading. Line up was to '5' and peaks were to '7'. The PPM did not arrive until 1938 and for a time retained the '5' and '7' line up. 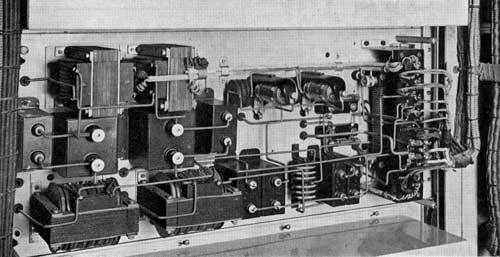 After the programme had been mixed and controlled so that the dynamic range was suitable for transmission, a 'C' amplifier was used to feed the Post Office line to the transmitter. This had a high input impedance (so that many 'C' amplifiers could be fed from one 'B' amplifier) and an output impedance of 600 ohms to feed the Post Office line. Each 'C' amplifier was associated with a specific outgoing line to a transmitter or SB centre. They could be adjusted to output the level specified by the Post Office for a particular line which could in fact be a loss rather than a gain. The amplifier's function was to act as a buffer as well as to feed the line from the correct source impedance. The outputs of the 'B' amplifiers were wired to 'C' amp input switching relays, which were operated from the simultaneous broadcasting position. There were twelve 'C' amps and ten sources - the outputs of the six transmission control positions and four of the 'D' amplifiers. An indicating device informed the SB engineer which source was connected to any of the 'C' amps. The 'D' amplifiers with a gain of about 45dB were used to amplify incoming Post Office lines and were somewhat similar to 'A' amplifiers. There were 6 of them, 2 for incoming programmes from Leeds and Daventry and the other 4 for Outside Broadcast lines and as spares. and for various headphone feeds. Each transmission position had a trap valve amplifier and there were 3 more for rehearsals and spares. The system used was known as 'B and C input switching'. It involved switching the various sources to the inputs of the control positions and thus to the input of the 'B' amplifier. The sources available were nineteen studios, the two Dramatic Control Panels, an interval signal, two SB lines, two OB lines, one echo room, Big Ben and two spares. 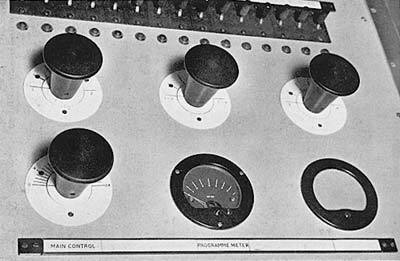 Every destination, which in 1932 usually meant a transmitter fed by a Post Office line, had its own 'C' amplifier feeding it and the outputs from the control positions were switched to the inputs of the 'C' amplifiers. 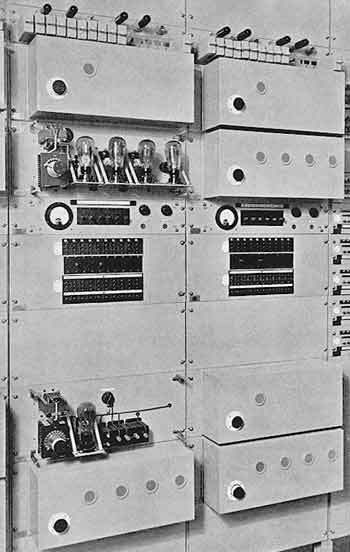 Various means of performing the switching are possible but in the 1932 control room it was done with relays - around 1,500 of them for the B and C input switching alone. In the following description note that relays were often made to operate by earthing one side of the relay coil, the other side being connected to 24 volts - in other words a negative earth system. Also amplifiers in the control room were powered by simply switching on the heater volts, there was no current drain from the HT or grid-bias supplies if the heater supply was off. To select a source to a fade unit, the AME first operated a key (the 'first operating key') associated with the channel input that he wished to use on his control position. This did three things; it applied an earth via what was known as a 'private wire' to a relay which turned on the control position 'B' amplifier, it applied an earth to the 'P' relay via the A4 back contacts of the 30 A relays associated with that control position input and it turned on the channel engaged lamp. The P relay operated and provided a path through its contact from the A relay to the 'Punching Key'. There were 30 of these, one for each source, and when one was momentarily pressed, 24 volts was applied via the closed P relay contacts and via the A relay to earth. The A relay operated, contact A3 was arranged to close first and apply 24 volts to hold relay A operated. Contact A4 opened and broke the circuit to the P relay thus preventing any other selection to that channel input. In the case of a transmission position, contact A5 operated the programme change-over relay which took the source away from the switching associated with the rehearsal positions and switched it to the transmission side of the switching relays. This was done to minimise cross-talk, only sources on transmission were present on the transmission relay wiring. It also meant that sources on transmission could not be selected at the rehearsal positions and sources needed for transmission were automatically switched away from rehearsal control positions. Contact A6 turned on the source's 'A' amplifier via other relays, which also switched on the 300 volts and 8 volts required by the studio microphones. A6 also lit an engaged lamp over all the punching keys for that source. A1 and A2 connected the source to the channel input. Until the 'first operating key' was released no further selections were possible on this channel. Although the diagram shows one P relay coil and one contact, in fact there were 30 contacts, one for each A relay. As 30 contacts on one relay is not normally possible, the P relay was in fact 4 relays operated in parallel with the 30 contacts shared between them. 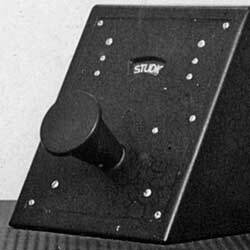 There were two- and four-channel control positions. The picture, right, shows a two-channel version. a buzzer on the control position, and a further light would indicate which studio had buzzed. The destination or C input switching was identical to that for source switching. There were 12 'C' amplifiers, which were fed from 10 sources. The switching was done at the Simultaneous Broadcast position shown on the floor plan as the Trunk Line Switching position. 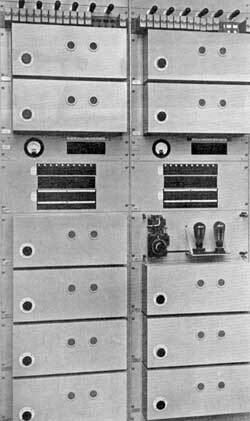 The sources were the 6 transmission control positions and 4 of the 'D' amplifiers. There was an indicator system to show the AME which source was connected to which 'C' amplifier. The 12 destinations included Leeds SB Centre, the Daventry long wave National transmitter and the Brookmans Park transmitter. if accidentally knocked or caught with the sleeve of an operator's jacket, the source would have been instantly disconnected. We have looked at the switching facilities associated with the CR control positions, here we look at the mixers. Some positions were equipped with mixers handling four sources, others could cope with only two. The two-channel mixers (right) had a single fader which cross-faded between the two sources. With the fader fully anti-clockwise the first source was faded up and the second down. Moving the fader clockwise increased the level of the second source until, with the fader central, the two sources were at equal strength. Further advancing the fader clockwise reduced the level of the first source. The output of the fader was routed through the main control potentiometer. On the four channel mixers (left) the two outer faders each cross-faded between two sources. The central fader took the outputs of the outer ones and handled them similarly. Finally the output of that fader was fed to the main control, lower left. stud before the off position gave an attenuation of 40dB. It was therefore the main fader that was used for level control. The diagram shows the arrangement of one of the larger studios, equipped with two or more microphones fed into a mixer in the listening room. The mixer had no level meter so was effectively used for balancing only. The output of the mixer was routed through the announcer's control unit. The announcer was able to select between the output of his own microphone and the mixer output. The output of this unit was then fed to the control room where its level could be adjusted at one of the control positions. Outside each studio was a yellow light which was operated from the House Superintendent's office by the official responsible for the booking of studios. The control room engineers could switch on the studios' red or blue lights (there were separate control positions for transmission and rehearsal) and operate the cue lights. These functions were not available in the listening rooms, though in some cases the announcer was provided with the means of operating a cue light in the studio. This would enable him to cue, say, a conductor, where there was no visual communication. There were feeds back from CR for the various loudspeakers and headphones - there was no monitoring directly from the mixer or announcers' control desk. Telephones in listening and announcing rooms linked directly to CR. The studio and announcing room had pushes to operate CR buzzers, and, in this instance, a buzzer in a band room. Studios which might be used with the Dramatic Control Rooms also had a means of operating a 'return light' in the DCR as a means of cueing the producer. 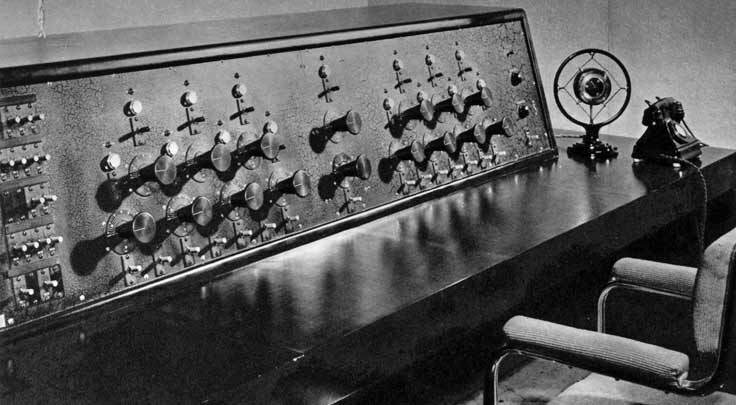 left - A three-channel listening room mixer. 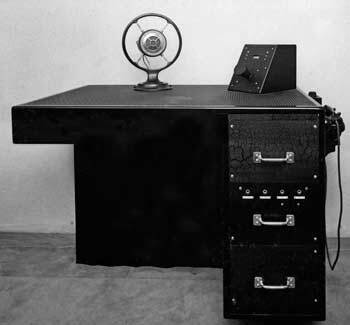 In addition to the potentiometers, the desk contained the necessary microphone decoupling arrangements and circuitry to reduce the 300 volt high tension supply to values suitable for operating the condenser microphones. These mics had their preamplifiers built into the microphone casing. right and below - An announcer's control desk. What appears to be a fader knob actually operates the switch which selects either the announcer's mic or the output of the listening room mixer. The detail photo shows that the selected source was displayed in a small window above the knob. Announcements could be made without the studio hearing them or having to be silent - hence the alternative name ('Silence Room') for these announcers' rooms. 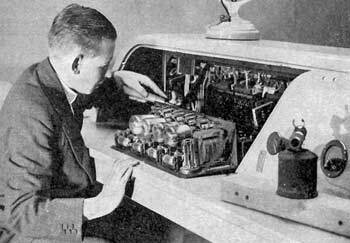 Again, the desk contained the necessary circuitry for the microphone. sub-basement up to the eighth floor. The cables then ran in horizontal ducts into the false floor of the control room. Although Dramatic Control Panels were by present day standards extremely simple passive mixers, it is very difficult today to work out accurately how they were used and by whom. Part of the problem is that with the outbreak of W.W.II and the economies that had to be made, the DCPs ceased to be used and were probably quickly dismantled. The result was that even people who joined the BBC in the early 1940s only know of them from brief references in books such as the 'Engineering Division Training Manual - 1942'. very accurate mock-up of a DCP as well as generally very realistic reconstructions of the productions group studios in Broadcasting House. It has been shown a couple of times on TV and is well worth a look if it's ever shown again. The film, and other evidence, suggests that Gielgud preferred to have an engineer at the controls, but some other producers preferred to operate the desk themselves. right - Val Gielgud (in the foreground) at the DCP. This appears to be the real thing, not a shot from the film. In the years that broadcasting has progressed, producers have become more and more ambitious. For certain shows they demand very many more studios than can be accommodated on the four-channel source mixer provided in the Control Room. 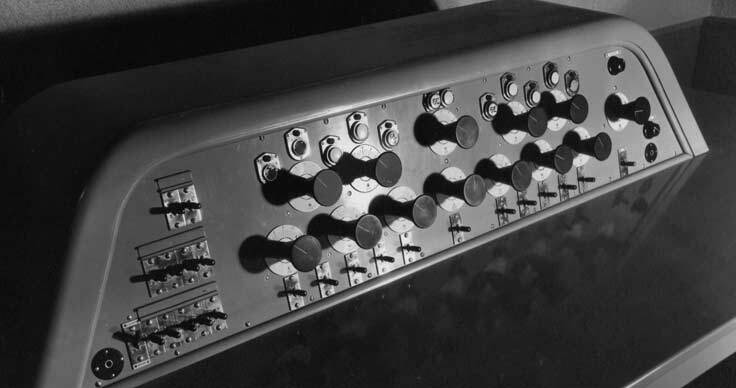 So an additional multi-channel mixer, known as a 'production panel', which can have the outputs of the 'A' amplifiers of anything up to 12 or 15 studios connected to it, has been devised. At this panel the producer sits and directs his programme in such a way as to obtain the correct continuity; the final output being fed to the source selector (in the Control Room) on one pair of wires. There was a tendency in peacetime for broadcasts to become technically over-elaborate. The use of a number of studios for one production was a growing habit which was catered for to a maximum of 15 channels by a somewhat complicated mixing and control unit known as a "productions panel". With the introduction of local control and the use of larger studios, this multi-studio tendency has largely disappeared and the engineering problems associated with big productions have correspondingly lessened. 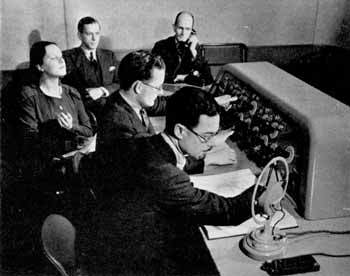 In any case, the stringencies of wartime broadcasting make such economies essential both as regards accommodation and equipment. This rather gives the impression that even pre-war production ambitions were not totally approved of by the engineering department! So Why Were Dramatic Control Panels Used? It had been realised in 1926 that 'perspective' was important. For example if a play calls for one actor to walk out of a room, then that actor needs to actually walk away from the microphone. If the microphone is simply faded down, the result will not be convincing. The trouble was that studios were in many cases acoustically dead (such as those intended for speech and the effects studios) and those that weren't 'dead' were uniformly treated with sound absorbent material so 'perspective' was very difficult to achieve. No doubt due to its limited range of acoustics, it was said that the 1932 6A was always recognisable as 6A whether it was supposed to a baronial hall, a living room or a law court. Another problem was that the microphones in use, mainly Marconi-Reisz carbon microphones, were virtually omni-directional except at the higher frequencies, so there was no 'dead' side, which again made it difficult to achieve perspective. In addition even very large studios had a limited number of microphones. For example, 6A which was 36 feet long and 16 feet wide had just 3 independent microphones even though it was used for the musical parts of drama productions and 'concert parties' as well as speech. The intention was that reverberation could be added as required to produce a different acoustic and there were 5 echo rooms available for this purpose. Without the use of a DCP echo could only be added by the control position engineer in the Control Room. (BBC usage has always been to use the word 'echo' when what is meant is 'reverberation'). This of course meant it was not under the control of the production staff who were responsible for the 'balance' and left to the judgement of the engineer who was only supposed to be responsible for 'control'. for one production to be on transmission and another in rehearsal or indeed the simultaneous production of two independent plays. There were two Dramatic Control Rooms situated on the north-west corner of the 8th floor opposite the doors leading to the rehearsal section of the Control Room. Both were wired so that they could be used either for rehearsals or transmissions. The equipment of the D.C. Rooms consisted of the usual red transmission and blue rehearsal lights and an indicator for return cue lights operated from those studios where orchestras were likely to play in conjunction with dramatic productions. These return cue lights were provided so that the staff in the Dramatic Control Room could be given a cue at the end of a piece of music and the indicator panel can be seen fixed to the wall at the top left of the photograph. There was a loudspeaker; a telephone for communication with the Control Room; a microphone for giving instructions to artists during the progress of a rehearsal and the dramatic control panel itself. The 'A' amplifier outputs of the studios required for a production were plugged to the DCP channel inputs in the Control Room at a bay adjacent to the 'A' amplifier bays. It seems likely the engineer plugging up the studios to the DCP would at the same time have switched on the 'A' amplifiers by operating the keys provided on the 'A' amplifier bay. The echo room inputs and outputs were on the same bay as the DCP inputs so any echo facilities needed were easily plugged up. 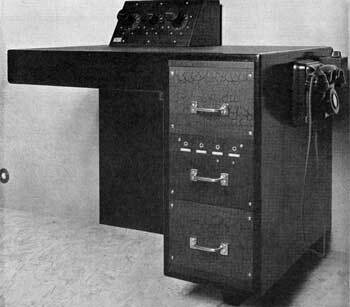 An echo room was fed from a second output on each 'A' amplifier and the echo return was plugged to the fader on the extreme right of the desk. room for up to 50dB mixing loss so that the DCP output arrived in the Control Room at -68dBu, that is at the same level as other sources. During rehearsals the producer could speak to all the artists in the studios via loudspeakers and, during transmissions, to the production staff responsible for the studios by means of headphones. Facilities were also provided for artists to listen to the progress of the production while the studio in which they were situated was not actually faded up. There were back-stop contacts on the faders that were said to operate relays that cut the programme to studio loudspeaker. It is not certain how this was achieved since normally a studio loudspeaker was fed from the Control Room via a trap valve amplifier which must have been plugged up as required as there does not appear to have been any relay switching involved. One possible solution would be that relay contacts could be plugged between the output of the trap valve and the line to the studio loudspeaker and perhaps each DCP input had a 'loudspeaker cut' pair of jacks associated with it to be plugged as required. are green cue light keys to the studios. Above the faders are small circular recesses containing lamps. Caps were provided which were engraved with the various studio names. An engineer put the appropriate caps into the recesses to identify which studio was on each fader. The lamps would light when control room plugged the studios to the DCP. A small red lamp immediately above each cap lit when the fader was moved from the off position. The cluster of keys on the left may have been prehear/talkback keys, or perhaps red or blue light keys; the circular object in the left hand corner of the panel is a headphone jack. From the 'Death at Broadcasting House' film it seems certain that the key under the echo fader at the far right is the producers talkback as Val Gielgud is seen operating it in the film and asking the desk operator to fade up a studio so that he could hear the reply. To the right of this talkback key is a headphone jack; the purpose of what looks like a rotary switch above it is uncertain. It was technically very complicated; once it was set up on transmission, it was impossible to locate faults. The use of many studios on one production meant that staff were dispersed on three or more floors, and it was necessary to have 'studio managers' (in the theatre sense) to keep track of artists and to make sure, not only that they reacted to the right cue light but that they were in the right studio. There was no control of dynamic range on the dramatic control panel, so again there was the problem of the engineer in the control room neutralising the intentions of the dramatic control panel operator. The dramatic control unit in D.C. Room No. 1 is equipped additionally with a main control potentiometer, whereby a producer can, if he wishes, have another official controlling the final output volume actually in the D.C. room; otherwise programmes are controlled at the control positions in the Control Room, or at the cubicle control desks. This main control and a programme meter were set into the rear of the desk, as can be clearly seen in the pictures, right. 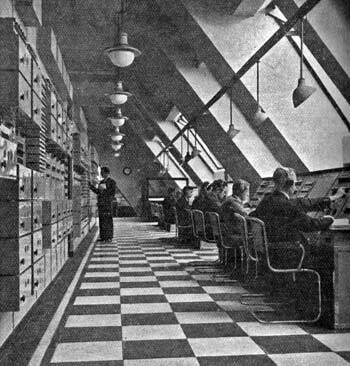 The second photo (probably not taken in 1932, but no later than 1936) shows a rear view of the desk being maintained and clearly shows the meter on the right edge of the picture. The main control can also be seen, though partly obscured by the object in the foreground, which is probably a blowtorch used to heat the engineer's soldering iron. 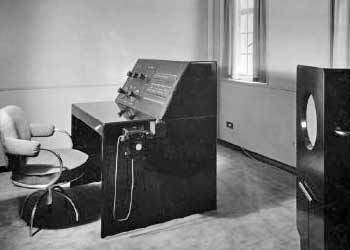 The next photo, which dates from 1937, suggests that the main control and meter were later resited in the box on the left of the panel. On the seventh floor were four cubicles containing mixers. 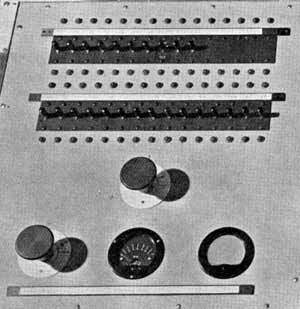 Two of these were associated with two of the transmission control positions in the Control Room (numbers 1 and 2), and the other two with two of the rehearsal positions (7 and 9). The rooms were acoustically treated and were provided with loud-speakers for monitoring. They were used for controlling 'important' music programmes and were operated by musically qualified staff. The first illustration is from a 1935 cigarette card. 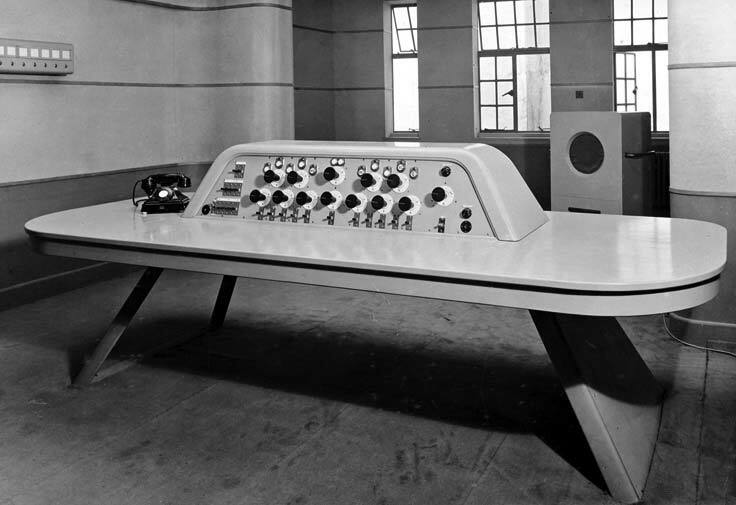 The desk was fitted with a four-channel fade unit, a main level control, a programme meter and studio red and green light keys. A telephone to the Control Room was also provided. The corresponding desks in Control Room had just four faders, and these music panels should be operationally similar. So perhaps the fifth fader shown in this shot is an echo return, similar to the fader at the right of the DCPs? Another possibility is that this desk had separate faders for each source, rather than the cross-fading system used on the Control Room desks. This would seem to be a better arrangement for controlling music programmes. the output of the control position from its B amplifier, and connected instead the output of the cubicle mixer.